It has been a bit since my blog entry but I can promise you I am working hard. Searching for trailers, looking for sponsers and working to find construction help. In the interim, I published a small piece on – why I want more of less. And it’s called oddly enough lol, “Why I want More of Less”. I’d like to thank Elephant Journal for supporting my writing and my vision. I have been tired for a long time. Not the kind of tired where you just can’t do anything or find it hard to get your day going. I have the kind of tired that forces me to move, to change, to want, to create. There are many reasons for my desire to live simply. I want more of less, if that makes any sense. Wanting more of less is going to free me to have a bigger life. For over a year I’ve watched, read and followed all things about tiny houses to the point where it was no longer an idea or a curiosity, but more of a need. It resonates with my soul. I decided to take the first plunge into real research by signing up for a Tumbleweed Tiny House Conference in January of 2015. The conference was in Orlando, Florida – making it even more appealing. as the unrelenting cold and ice in New York City was slowly killing my spirit this winter. First, let me just say that even if you are not planning to use them as your building company, but are thinking or planning to build a tiny home, I encourage you to go to one of their conferences. When I first signed up. I called the company to just ask what I could expect by going to this conference. They are so lovely and always willing to answer questions. I had no idea what to expect, or even how I was planning to do this. I have no money and live in the city for God’s sake. But I can tell you what I have, gumption, fearlessness and intense desire and curiosity. That curiosity has helped me have develope some wonderful connections with other Tiny Housers. Upon arriving at the conference, I was so taken back by how many people were there. For some reason I thought there would be maybe 30 people. but to my surprise, there had to be at least 100 like minded people. There were people of various ages, backgrounds, and cities. Some were young couples, students, contractors, people nearing retirement, attorneys, engineers etc…And the overall consensus of why we were all there was “freedom”. We all want financial freedom, more time for living, more time for people and less stuff to be attached to. I am one of those people who went back to school so that I could support my then young son as a single mother. Laden with student loan debt even after being at my job for over 14 years, I feel like a prisoner. My job has been a blessing in my life, It has afforded me to support my son and has given me a life time of wonderful memories. both from my students and the wonderful people I have worked with. My son is now grown and I am nearing an age where I can choose to retire and live a different kind of life. I have made a conscious decision to retire in two years. No longer wishing to be a prisoner to a future or pension that may never come. I am choosing to live for today. Building a tiny home will ensure that I have a roof over my head and a home that I have built on my own with the freedom to build over a time frame that will keep me mortgage and debt free. 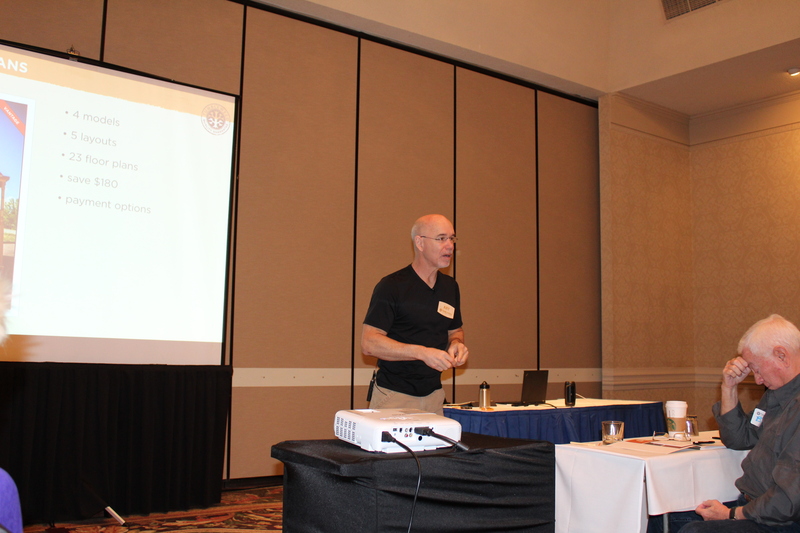 Our presenter, at the two day conference, was Art Cromier. 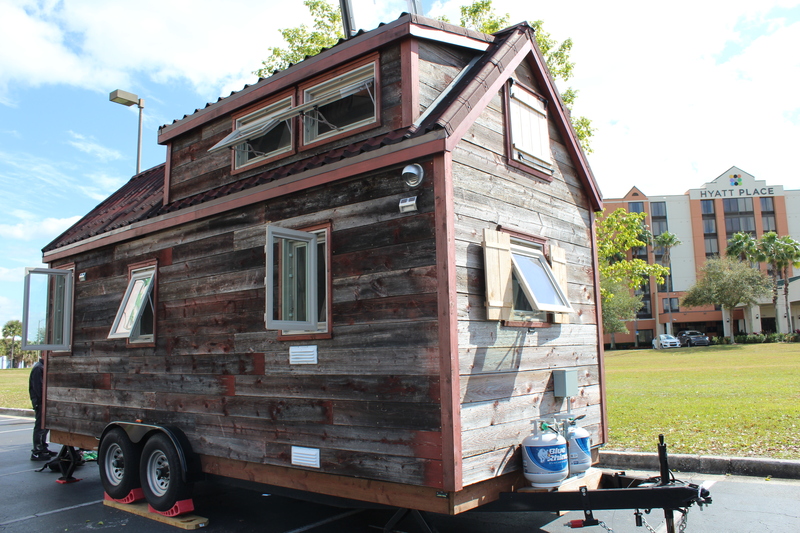 Art built his own tiny home and is a presenter for Tumbleweed. It was a gift to have a presenter who could walk you through the building process from his own experience. Art generously gave tips, shared mistakes, lessons and answered many questions. For instance, he shared that he has a ladder to ascend to his sleeping loft but has changed his perspective and feels that stairs are better and less slippery especially as we get older even though stairs take away from precious floor space. Space is the key to design as going tiny is not an easy thing and it takes quite a bit of purging to do it. But, in Art’s words. “all we need as humans, love, warmth and shelter can be had in a 175 foot space. You can watch many of Art building and installation Videos on YouTube. Also present at the conference, Jenna and Guillaume. This young couple built their tiny home with their Tumbleweed plans and are traveling the United States with their tiny home. Graciously, they opened up their home at the conference and gave us a tour and answered so many questions and provided such helpful tips to us. Their home is sweet and Jenna has made it her own work of art, adding vintage crate boxes for stairs and uses burlap as a utensil holder. Their home is a creative and lovely example of living small. If you want a real treat, follow their journey. Their blog is a plethora a beautiful writing by Jenna and scenic gorgeous photos by Guillaume. Be forewarned though, if you plan on attending one of the these conferences, make sure that if you want to see a tiny house that you inquire prior to booking it, if there will be a tiny house to view. Jenna and Guillaume said that not all conferences have a tiny home for viewing and may be a disappointment to some. So if you are planning to attend, it’s a good idea to call Tumbleweed and just ask if there will be a home at the conference. It would be disappointing not to see one especially, if like me, you flew to another state thinking there would be one and then one was not available. Other than that be prepared to be inspired and like me, be full of anticipation and excitement! 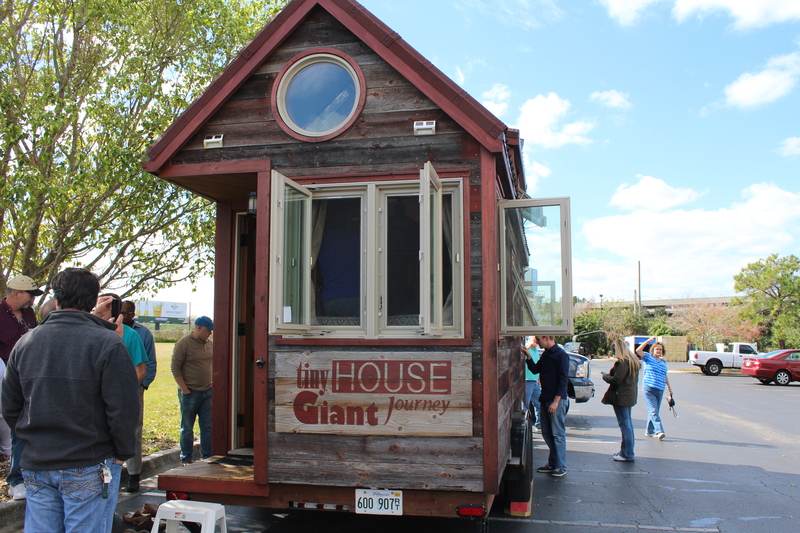 In thinking of the beginning, I thought that my love for tiny houses grew to be a thing a couple of years ago when I haphazardly bumped into the Tiny House Movement while googling for God knows what. While processing my desire to someday build my own tiny home, I was drawn to memories of my early childhood. I was born in rural Central Puerto Rico, in a small town called Morovis; or as some call it “la isla menos Morovis” – all the island except Morovis; in reference to the Cholera out break of 1853 that ravaged the island minus this small municipality. Many think that this phrase used to identify it could be seen as negative but in reality it is quite the opposite – it’s like a miracle spared this small town. My mother bore me into this world, on a hot summer day in the tiny house with a tin roof – in the same bed where my maternal grandmother left this world. My Taino Indian grandmother lived and died in this same house. ln this house she raised four sons and four daughters. The house was meager to say the least (probably less than 500 feet). It had two bedrooms, small common area and a small kitchen. There were no glass windows, only wood shutters that were open most of the time and closed only when the rains came. It stood on cement blocks to provide shelter underneath during storms and hurricanes. It was also, one of my favorite hiding places, where the dark earth cooled my sun drenched skin. Upon my grandmothers death, she asked all of my mothers siblings to allow my mother to keep the home, as she was the only one of the siblings who did not have her own home. Thus it came to be, that this was the wonderful place where I got to run wild and free for the first five years of my life. My memories are few, but I do remember feeling happy and free. I was most often barefoot and chasing the chicks whose mother hen would jump wildly to peck at me in order to make me stop. It was the place where my paternal grandfather would catch the tiny lizards that came into the house and would clip them to his ears like dangling earrings to amuse me and make me scream with laughter. It was the home where the chickens came in the house and walked around as if they were part of the household or the children who lived in it. It was the place where the sun shone bright and the night stars were even brighter. It was a tiny home with the biggest sky above it. When my parents decided to leave Puerto Rico to migrate to New Jersey where both my parents went to work in factories, the tiny house with the tin roof was left behind and so was the carefree life style that I’d known or at least I believed it to be. No longer could I run barefoot with the chickens, and the sound of rain on the tin roof became a distant memory. My parents gave up a certain kind of freedom for the “American Dream” ~ and even then, they never owned another home nor a tiny one for that matter. I am not sure that it was a trade up. Perhaps it was not as wonderful for them as it was in the memories of a child, but I do know that it was by far a simpler less restricted life.